The hostess moved on and McKenna held her smile, her gaze skimming the room to see if there might be a suitable chair somewhere, when she spotted an exceptionally tall man in the opposite doorway. He was dressed much as the other gentlemen in a narrow tailored sack suit, with a wingtip collar and a four in hand tie, except he looked nothing like the others filling the parlor and library, and not just because of his height. The breadth of his shoulders set him apart, no padding needed in his jacket to accent his frame. He was muscular through the shoulders and chest, and yet slim through the waist and hip. She dropped her gaze when she realized he was also looking at her. She’d expected he’d turn away then, but he didn’t. She could feel his attention, and she grew warm beneath his intimate scrutiny. He had no manners. Did he think to take advantage of her fallen state? Finally, she glanced up, straight into his face, thinking she’d give him a measure of her displeasure, but when her eyes met his, her lips parted with shock. The room seemed to tilt and shift. Her legs were no longer steady. She put a hand to her middle to try to catch her breath. She stared at him, astonished. It’d been years since she last saw him, four and a half at least. He’d been a frequent visitor during her mother’s illness and then again, after the funeral. But once she’d returned to Vassar, after the end of that awful January, she hadn’t seen Sinclair again even though she’d promised him she’d return as soon as she graduated in June. Instead, she wrote him that she’d been invited to travel with friends, and the invitations kept coming. Six months became a year, and then another year, and another. Heart pounding, McKenna continued to drink him in, noting yet again the fashionable fit of the suit and the crisp white points of his shirt against his skin. He had more color than the last time she saw him. Clearly he wasn’t spending all his days underground anymore. His dark blonde hair looked almost brown with the pomade to slick it back. He was both familiar and unfamiliar at the same time. This afternoon he wore the suit of a gentleman, but he’d never been a gentleman. He was a miner, one of her father’s men. And before her father’s man, he’d been her friend. She sucked in a breath and turned away, looking blindly for a place to go, somewhere she could hide and recover from the shock. It was too much, seeing him here. It was too much after everything that had happened. The scrape of curtains across windows announced the start of the ghost stories. Candles began to be snuffed out. McKenna slipped from the room, out into the hall, heading for the room upstairs where guests could leave their cloaks and coats. McKenna went there now, not knowing where else to go. She paced the spacious bedroom twice, a knuckle pressed to her mouth to keep her from making a sound. Once upon a time Sinclair Douglas had been her world. Once upon a time he’d been her sun and her moon and all her dreams wrapped up in one man. But then she left Montana, and discovered the world. and she fell in love with the whole world, realizing it was so much bigger than Butte. Realizing that she had so much more that she could want and be, more than just marriage and motherhood. And so she reached for it all, forgetting what happened to Daedalus when he soared too high, flying too close to the sun. She shouldn’t have jumped so high, wanting so much. She should have been content with quiet domestic comforts. She should have been more like her sister, happy with the hearth, and home. 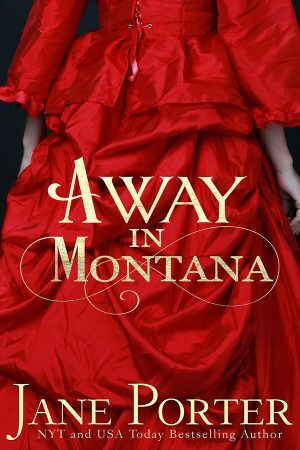 Can’t get enough of Montana? This extra is for you! Is there a better setting than Marietta, Montana for romance? You’ll feel right at home with this beautiful turn-of-the-century map extra! Jane Porter gives her characters soul. They appear real and wonderful — even when not so nice.